These are the results of the latest poll conducted by the Palestinian Center for Policy and Survey Research (PSR) in the West Bank and the Gaza Strip between 10 and 12 December 2015. The period before the poll witnessed significant escalation in Palestinian-Israeli confrontations with increased number of stabbings by young Palestinians in the West Bank and in Israel and stone throwing at checkpoints and other areas of friction. At his UN speech in September, PA president Mahmoud Abbas threatened to suspend Palestinian implementation of the Oslo agreement obligation as long as Israel does not implement its own obligations. There were several terrorist attacks in Paris and Beirut and the downing of a Russian civilian plane over Sinai in October. Major waves of refugees from Syria, Libya and Iraq hit Europe during the months preceding data collection. This press release addresses many of those issues and covers attitudes regarding Palestinian elections, conditions in the West Bank and the Gaza Strip, reconciliation, Palestinian-Israeli confrontations, the Palestinian threat to dismantle the Oslo agreement, and other internal and international issues. Total size of the sample is 1270 adults interviewed face to face in 127 randomly selected locations. Margin of error is 3%. Findings of the last quarter of 2015 indicate a continuation of three recent developments documented in our last poll in September: two thirds continue to demand the resignation of president Abbas; a growing majority supports return to an armed intifada; and a growing majority continues to reject the two-state solution. Moreover, while a majority supports ending PA commitment to the Oslo agreement, a similar majority doubts Abbas’ seriousness about abandoning that agreement. As we found in our last poll in September, the “Oslo generation” of youth between the ages of 18 and 22 are the most supportive of an armed intifada and stabbings and the least supportive of the two-state solution. If presidential elections are held today, Hamas candidate would win a clear victory against Abbas. If parliamentary elections are held today, Hamas and Fatah would receive two-thirds of the popular vote, one third each. But Marwan Barghouti remains Fatah’s only hope of defeating Hamas. In the context of the current escalation in Palestinian-Israeli confrontations, two thirds support stabbing attacks against Israelis even though an almost three quarters express opposition to the involvement of young school girls in such stabbings. Half of the public believes that the current confrontations will escalate into an armed intifada. If so, two thirds believe that the armed intifada will serve Palestinian national interests in ways that negotiations could not. Findings also indicate a growing rejection of the two-state solution. Similarly, two thirds believe that the two-state solution is no longer viable due to settlement expansion, and three quarters believe that the chances for the establishment of a Palestinian state next to the state of Israel in the next five years are slim or none existing. Responding to the declaration by the Palestinian president that the PA will not continue to honor its Oslo commitments if Israel continues to ignore its own Oslo obligations, two thirds say they support abandoning the Oslo agreement. A similar majority however does not believe that Abbas is serious about his declared intention to abandon the Oslo Accords. Regardless of the price that Palestinians might have to pay, the public is particularly in favor of ending security coordination even though a smaller majority supports also the suspension of Palestinian-Israeli civil coordination. Two thirds support knifing attacks, but three quarters oppose the participation of young school girls in such attacks. Two thirds believe that if the current confrontations develop into an armed intifada, it will help in achieving national interests in ways that negotiations could not. By contrast, only 51% believe that if the current confrontations continue as they are, such confrontations will help in achieving national rights in ways that negotiations could not. Only 51% of the public believe that most Palestinians who were killed after being shot by Israelis have indeed stabbed or attempted to stab Israelis. 71% of the public believes that Hamas supports the current confrontations; 59% believes that Fatah supports these confrontations; but only 33% believe that Abbas supports them. 67% support and 31% oppose use of knives in the current confrontations with Israel. But about three quarters (73%) oppose the participation of young school girls in the stabbing attacks and a quarter supports it. Support for stabbing attacks is higher in the Gaza Strip (85%) compared to the West Bank (57%), in refugee camps and cities (71% and 69% respectively) compared to villages/towns (55%), among men (69%) compared to women (65%), among refugees (72%) compared to non-refugees (64%), among those who work in the private sector (70%) compared to those who work in the public sector (65%), among the youth between 18-22 years old (73%) compared to those who are 50 years old and above (64%), and among voters of Hamas and third parties (86% and 67% respectively) compared to those who do not intend to participate in parliamentary elections, the undecided, and Fatah voters (62%, 62% and 59%). 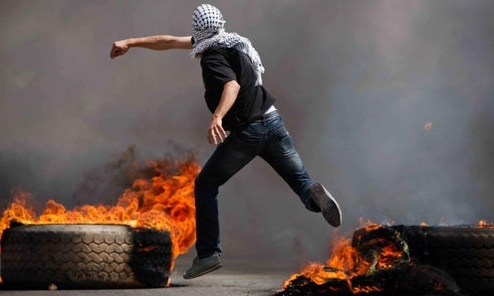 37% believe that the current confrontations will develop into a new armed intifada, 18% believe they will develop into wide scale peaceful popular confrontations, and 13% believe they will develop in both directions. By contrast, 19% believe the confrontation will stay as they are now and 10% believe they will gradually dissipate. 66% of the public believe that if the current confrontations develop into an armed intifada, such a development would serve Palestinian national interests in ways that negotiations could not. The percentage of those who believe that a turn to an armed intifada would help Palestinians achieve national rights that negotiations could not is higher in the Gaza Strip (71%) compared to the West Bank (63%), among students (75%) compared to employees, unemployed, and retirees (64%, 57%, and 55% respectively), among those who work in the private sector (72%) compared to those who work in the public sector (65%), among the youth between 18-22 years old (70%) compared to those who are 50 years old and above (62%), and among Hamas voters (85%) compared to those who do not intend to participate in parliamentary elections, the undecided, third parties’ voters, and Fatah voters (64%, 63%, 61%, and 54% respectively). 50% of the public (61% in the Gaza Strip and 43% in the West Bank) believe that if the current confrontations develop into wide scale peaceful popular confrontations, such a development would serve Palestinian national interests in ways that negotiations could not. 51% of the public (62% in the Gaza Strip and 43% in the West Bank) believe that if the current confrontations stay as they are now, they would serve Palestinian national interests in ways that negotiations could not. 51% of the Palestinian public (67% in the Gaza Strip and 40% in the West Bank) believe that most of the Palestinians who fell after being shot by the Israeli army or settlers have in fact stabbed or were attempting to stab Israelis. But 47% believe that most of those who were shot have not stabbed or were not attempting to stab Israelis. We ask the public in an open-ended question what reason it believes behind the lack of large popular participation in the current confrontations. The largest percentage (43%) said that the reason might be fear of the PA or the occupation; 19% thought the reason is despair and the belief that the confrontations are likely to be in vain; 6% said that most people are busy providing for their families; 5% said it is due to lack of factional leadership for the current confrontations; and 4% said it has to do with the lack of friction points with the Israeli occupation forces. We also asked the public in an open-ended question about the motivation of the little school girls who participate in stabbing attacks: 41% said they believe they are driven by national motivation; 26% said the motivation was personal; and 16% said the motivation was religious. 11% said it was a combination of national and religious motivations. When comparing the level of support of various parties for the current confrontations, Hamas comes on top with 71% of the public believing that it supports them, followed by the PFLP, receiving 66%, Fatah (59%), and al Mubadara or the Initiative (53%). By contrast, only 33% say president Abbas supports the confrontations, 28% say Jordan supports them, and only 14% say Egypt supports them. 90% believe that Israel does not abide by the Oslo Agreement and 68% support abandoning that agreement. Two thirds believe that President Abbas is not serious about abandoning the Oslo Agreement. 70% support a ban on the importation of Israeli goods; 64% support ending security coordination; and 58% support ending civil coordination even if such steps lead to Israeli retaliation. 90% of the public believe that Israel does not abide by the Oslo agreement and 6% believe it does. 68% support and 25% oppose abandoning the Oslo agreement. Support for abandoning the Oslo Agreement is higher in the Gaza Strip (73%) compared to the West Bank (66%), in refugees camps and cities (77% and 69% respectively) compared to villages/towns (61%), among men (71%) compared to women (66%), among holders of BA degree (72%) compared to the illiterates (27%), among Hamas voters, the undecided, and those who do not intend to participate in parliamentary elections (77%, 70%, and 67% respectively) compared to voters of Fatah and third parties (63% and 60%). But 67% of those who believe that Israel does not abide by the Oslo agreement believe that president Abbas is not serious about abandoning Palestinian Oslo obligations and only 25% think he is serious. Percentage of those who believe that Abbas is not serious about abandoning the Oslo Agreement is higher in the West Bank (68%) compared to the Gaza Strip (64%), in cities and refugee camps (68% and 65% respectively) compared to villages/towns (61%), among men (69%) compared to women (65%), among holders of BA degree (67%) compared to illiterates (55%), among students (73%) compared to employees and housewives (64% and 63% respectively), and among Hamas voters, those who do not intend to participate in parliamentary elections, third parties voters, and the undecided (82%, 74%, 72%, and 65% respectively) compared to Fatah voters (40%). 70% support and 26% oppose a decision to ban entry of Israeli products into Palestinian areas even if Israel responded by banning the entry of Palestinian products into Israel. 64% support and 33% oppose a decision to stop security coordination with Israel even if Israel responded by preventing Palestinian police access to B and C areas. Similarly, 58% support and 39% oppose a decision to stop civil coordination with Israel even if Israel responded by banning the travel of those carrying newly issued Palestinian passports that were not coordinated with Israel. Support for ending security coordination despite expected Israeli counter measures is higher in the Gaza Strip (72%) compared to the West Bank (59%), in refugee camps and cities (68% and 64% respectively) compared to villages/towns (60%), among men (66%) compared to women (63%), among holders of BA degree (69%) compared to illiterates (58%), among the youth between 18-22 years (66%) compared to those who are 50 years old and above (60%), and among Hamas voters (74%) compared to third parties’ voters, Fatah voters, those who do not intend to participate in parliamentary elections, and the undecided (65%, 61%, 60%, and 59% respectively). A majority of 52% believe that Israel will abandon its current settlement policy and agree to enter serious negotiations to end its occupation if the Palestinian side suspended its implementation of its Oslo obligations. By contrast, 37% believe that a Palestinian suspension of its Oslo obligations will lead to PA collapse and the return of the Israeli civil administration. 65% want president Abbas to resign and 31% do not want him to resign. In presidential elections between Abbas and Haniyeh, the latter receives 51% and the latter 41% of the vote. In presidential elections between Marwan Barghouti and Haniyeh, the former wins by 56%; the latter receives 38% of the vote. In parliamentary elections, Fatah receives 33%, Hamas 33%, all third parties combined 11%, and 23% remain undecided. 65% of the public want president Abbas to resign while 31% want him to remain in office. These results are identical to those obtained in our previous poll three months ago. The percentage of those who demand Abbas’ resignation is higher in the Gaza Strip (67%) than in the West Bank (63%), in refugee camps and cities (69% and 66% respectively) compared to villages/towns (58%), among refugees (67% compared to non-refugees (63%), among holders of BA degree (68%) compared to illiterates (47%), among youth between 18-22 years old (67%) compared to those whose age is 50 years and above (58%), and among Hamas voters, those who did not decide to whom they will vote, those who will not participate in parliamentary elections, and voters of third parties (96%, 71%, 69%, and 66% respectively) compared to Fatah voters (27%). If president Abbas does not nominate himself in a new elections, 30% prefer to see Marwan Barghouti replacing him, while 21% prefer Ismail Haniyeh. Ramil al Hamdallah, Khalid Mishal and Mohammad Dahlan, and Mustapha Barghouti receive 6% each; Salam Fayyad receives 4% and Saeb Erikat receives 3%. If new presidential elections were held today and only two were nominated, Ismail Haniyeh and Mahmoud Abbas, the former would win 51% (compared to 49% three months ago) and the latter 41% (compared to 44% three months ago). Vote for Haniyeh is greater in the West Bank (53%) compared to the Gaza Strip (48%), in refugee camps and cities (53% and 52% respectively) compared to villages/towns (44%), among women (52%) compared to men (49%), among refugees (56%) compared to non-refugees (47%), among students and housewives (59% and 54% respectively) compared to employees, unemployed, and the retired (44%, 42%, and 28% respectively), among those who work in the private sector (54%) compared to those who work in the public sector (38%), and among those who intend to vote for Hamas in parliamentary elections, third parties voters, and those who do not intend to participate in legislative elections (97%, 54%, and 53% respectively) compared to those who intend to vote for Fatah and those who did not decide yet to whom they intend to vote (5% and 32% respectively). Level of satisfaction with the performance of president Abbas continues to decline from 38% three months ago to 35% in this poll; satisfaction with Abbas stood at 44% six months ago. If presidential elections were between Marwan Barghouti and Haniyeh, the former would receive 56% and the latter would receive 38% of the participants’ votes. If presidential elections were between three: Mahmud Abbas, Marwan Barghouti and Ismail Haniyeh, Abbas would receive 25%, Barghouti 36% and Haniyeh 35%. If new legislative elections were held today with the participation of all factions, 71% say they would participate in such elections. Of those who would participate, 33% say they would vote for Hamas and 33% say they would vote for Fatah, 11% would vote for all other third parties combined, and 23% are undecided. Three months ago, vote for Hamas stood at 35% and Fatah at 35%. In June 2014, just before the Gaza war, vote for Hamas stood at 32% and Fatah 40%. Vote for Hamas in the Gaza Strip stands in this poll at 35% and for Fatah at 37%. In the West Bank vote for Hamas stands at 32% and Fatah at 30%. Perception of safety and security rises in the Gaza Strip and declines in the West Bank. Percentage of those wishing to emigrate stands at 41% in the Gaza Strip and 24% in the West Bank. Preferred areas for immigration are Europe, Gulf countries, Turkey, and lastly the US. Al Aqsa satellite station receives the highest viewership followed by Palestine TV, Ma’an, and al Jazeera. Optimism regarding the success of reconciliation declines to 30%. Positive evaluation of conditions in the Gaza Strip stands at 15% and positive evaluation of conditions in the West Bank stands at 21%. Perception of safety and security in the Gaza Strip stands at 53%. In the West Bank perception of safety and security stands at 29%. Three months ago, perception of safety and security in the Gaza Strip stood at 40% and in the West Bank at 49%. Findings show that the percentage of Gazans who say they seek to immigrate to other countries stands at 41%; in the West Bank, the percentage stands at 24%. 47% of the Palestinian public believe that if emigration was feasible, 40% or more of Gazans would emigrate, 15% say that the percentage of Gazans who would seek to emigrate is likely to be between 25% and 40%, and 38% say that about a quarter Gazans would emigrate. Area preferred by Palestinians seeking to emigrate to is Europe, selected by 44% of them (Sweden is the most preferred country selected by 17%, followed Germany selected by 8%, Norway was selected by 4%, and 15% selected other European countries). 15% selected Arab Gulf countries, 13% selected Turkey, 12% selected the US, 4% selected Canada, and 4% selected Jordan. Hamas’ al Aqsa TV viewership is the highest, standing at 23%, followed by Palestine TV (22%), Al Jazeera and Ma’an-Mix at 16% each, and Al Arabiyya at 6%. Perception of corruption in PA institutions stands at 78%. 18% say there is press freedom in the West Bank and 20% say the same about the status of the press in the Gaza Strip. 34% of the Palestinian public say people in the West Bank can criticize the PA authority in the West Bank without fear. Optimism about the success of reconciliation and the end of the split stands today at 30% and pessimism at 66%. Three months ago optimism stood at 40% and pessimism at 56%. Belief that Hamas was responsible for hindering the functioning of the reconciliation government does not exceed 23% while 30% believe that the PA and president Abbas were to blame for that and 14% blame the head of the reconciliation government. In the absence of negotiations, 60% support return to an armed intifada and an identical percentage supports peaceful popular resistance. Support for a two-state solution continues to decline, standing today at 45%. Support for a permanent political settlement along the lines of the Clinton parameters and the Geneva Initiative stands today at 36%. 65% believe the two state solution is no longer practical due to settlement construction and 75% believe that the chances for the creation of a Palestinian state during the next five years are slim to non-existent. 82% believe that Israel’s long term aspirations are to extend its borders to include all territories occupied in 1967 and expel the Palestinian inhabitants or deny them their political rights. 51% believe that Israel plans to destroy al Aqsa Mosque and the Dome of the Rock and build a Jewish temple in their place. In the absence of a peace negotiation, 60% support a return to an armed intifada; 76% support joining more international organizations; 60% support a popular non-violent resistance; 46% support the dissolution of the PA. Three months ago, only 57% supported return to armed intifada. Only 45% support and 54% oppose the two-state solution. Three months ago, 48% supported and 51% opposed this solution. Support for the two-state solution is almost equal in the West Bank and the Gaza Strip (46% and 45% respectively) and among refugees and non-refugees (45% and 46% respectively). But it is higher in villages/towns and refugee camps (49% and 48% respectively) compared to cities (44%), among the illiterates and holders of elementary education (55% and 51%) compared to holders of BA degree (45%), among retirees and employees (71% and 50% respectively) compared to students and housewives (35% and 44% respectively), among those who work in the public sector (51%) compared to those who work in the private sector (46%), among those who are married (47%) compared to the unmarried (40%), and among Fatah voters (69%) compared to third parties’ voters, those who do not intend to participate in parliamentary elections, the undecided, and Hamas voters (47%, 44%, 44%, and 23% respectively). 36% support and 62% oppose a package permanent settlement along the lines of the Clinton Parameters and the Geneva Initiative. But 12% of those opposed to the package change their mind and accept it if Israel also accepted the Arab Peace Initiative. As shown in the table below, the public is divided equally on the item related to the settlement of the border and territorial swap (50% support and 50% oppose). A majority supports one item, the one related to end of conflict, supported by 58% and opposed by 41%. A majority opposes all remaining four items: only 45% support and 54% oppose the item related to security arrangements; only 39% support and 60% oppose the item related to refugees settlement; only 29% support and 71% oppose the item related the disarming the Palestinian state so that it would not have an army; and finally only 24% support and 76% oppose the item related to dividing East Jerusalem and the Israeli annexation of some parts of it. Palestinian views on the most effective means of establishing a Palestinian state alongside the state of Israel vary: 46% think that armed action is the most effective, 26% think negotiation is the most effective, and 23% think popular non-violent resistance is the most effective. Three months ago, only 42% said armed action was the most effective and 29% said negotiation was the most effective. A majority of 65% believes that the two-state solution is no longer practical due to settlement expansion while 34% say it is still practical. Despite this, only 29% support, and 70% oppose, a one-state solution in which Arabs and Jews enjoy equal rights. 75% believe that the chances for establishing a Palestinian state next to the state of Israel in the next five years are slim to non-existent and 24% believe the chances are high or medium. Findings also show that 45% support the Arab Peace Initiative and 53% oppose it. Similarly, only 39% support a mutual recognition of national identity of Israel as the state for the Jewish people and Palestine as the state for the Palestinian people and 61% oppose it. The percentage of those who are worried that they would be hurt by Israel or that their land would be confiscated or homes demolished stands at 79%. 21% are not worried. Furthermore, an overwhelming majority of 82% believes that Israel’s long term aspiration is to annex the lands occupied in 1967 and expel their population or deny them their rights. 16% believe that Israel’s long term aspiration is to insure its security and withdraw from all or most of the territories occupied in 1967.When asked about the long term aspiration of the PA and the PLO, 65% said that it is to recover all or parts of the land occupied in 1967 while 26% said it was to conquer the state of Israel or conquer the state of Israel and kill most of the Jews. An overwhelming majority believes that al Haram al Sharif is in grave danger: 51% believe that Israel intends to destroy al-Aqsa Mosque and the Dome of the Rock and replace them with a Jewish temple; 17% believe that it intends to divide the plateau on which the two mosques sit so that Jews would have a synagogue alongside the Muslim holy places; and 9% believe that Israel intends to change the status quo prevailing in the plateau since 1967 by allowing Jews to pray there. Only 11% believe that Israel is interested in maintaining the status quo without change. 88% believe that ISIS does not represent true Islam. An overwhelming majority opposes ISIS attacks in Lebanon, Sinai, and Paris. 55% believe that European treatment of refugees are bad or mostly bad. An overwhelming majority of 88% believes that ISIS is a radical group that does not represent true Islam and 7% believe it does represent true Islam. 5% are not sure or do not know. In the Gaza Strip, 10% (compared to 5% in the West Bank) say ISIS represents true Islam.77% support and 20% oppose the war waged by Arab and Western countries against ISIS. 87% oppose the recent bombings in Lebanon and 8% support them; 80% oppose the November Paris attacks and 14% support them; and 78% oppose the downing of the Russian plane in October and 16% support it. 42% believe that the Paris attacks will have no impact on the Palestinian cause but 41% think they will have a negative impact and 8% think they will have a positive impact. 55% say the European treatment of the current wave of refugees from countries like Syria, Libya, and Iraq is bad or mostly bad and 37% say it is good or mostly good.